I remember the sound of the bugle at seven am on crisp June mornings. I remember the snap of the flags as the Commissioners posted them high for the day. I remember the clatter of breakfast dishes and the chatter boys. I remember the banging of hammers, splashing of swimmers, and the cracking of rifle fire. I remember the smell of the sweet, warm summer air and the blanket of stars to comfort me at night. I remember older campers - dads, leaders, and visitors - passing down the wisdom of their years. I remember past staff photos - holding me to my oath, law, and obligations. I remember the thunder of the cannon announcing the close of day over Panther Pond. I remember the ping of pipes in the showers - a warning of scorching water approaching. I remember my 'Second Homes' - Pershing, Condo 2, Androscoggin, Skid Ridge, and Pine Tree. I remember song and dance in the Ring Dining Hall. I remember pounding rough-hewn plaques to an ancient building. I remember flickering flames, boys in drag, and staff singing 'On My Honor' at evening campfire. I remember weekends at Little Sebago and a Pope on the dock. I remember lifting boats, trimming tents, and cleaning latrines. and explaining how a motorboat prop got destroyed. I remember buried treasure on the 75th anniversary. I remember a sea of white sashes with red arrows on Thursdays. I remember Mike's house, cribbage at the Training Center, and vacations in the Florida Keys. I remember staff parties - Greek, Mexican, and Carribbean. I remember 'Harry Kakelegion,' 'the Scotsman,' and a Tee-A-Ta circle. and telephoned feedback from the residents of the lake. I remember laughing kids, grateful leaders, and accomplished staffs. I remember what a Shax is. I remember mentors and guides. I remember seeing William Hinds and hoping I did him proud. I remember, and I return to these fond times in my mind. Getting up early to play the scratchy Revilee record (till Dean figured out a way to computerize them) ... Mike Cook, Larry Roy, and Brian Dumont doing a great 'Blue Moon' doo-wop set at campfires ... never being found in a staff hunt ... Steak dinners with staff waiters in tuxedos serving 'vin de bug' and Jeff Violette playing the keyboards for mood music ... leaning on the terrarium rail with young scouts just in awe ... the Alfred E Neuman Award ... Doing the Order of the Oar with Glen Gisel & Bruce Rueger (no, there wasn’t a hint of abuse) ... slush puppies with gummie worms ... the partridge that used to perch on the rifle range target line and lived to tell the story ... Dean singing 'Gary Owen' and Bruce singing 'If I were Not a Boy Scout' ... the indian on the rock during retreat ... kids getting back from swamp romps (they told me no one would sign up for them!) ... 3 million parents eating bbq chicken, macaroni salad, & cherry tarts ... a certain half asleep staff member arriving to breakfast without his pants ... being a buddy at free swim to the kid who nobody wanted to buddy up with ... Webelos Week when Scott Valcourt played an alien with a light bulb head and the kids really thought we had been invaded ... watching adults looking for their plaque & now doing it myself ... staff swims under the lights ... 'polite, polite, polite, courteous, courteous, courteous, please, please, please, thank you, thank you, thank you' (staff will remember) ... Indoor campfires on rainy nights ... doing Sam Magee a zillion times ... the 'chipmunk from hell' who ate a whole case of atomic fire balls in the trading post ... spending time with homesick kids ... night motorboat rides (camp directors break rules, too) ... international Staff, especially Keith Nixon and Allen Dennis ... ”This is My Camp” buttons ... Some bad stuff too, like having to fire a few staff members and kids getting injured ... the cry of the loons ... the feeling of being the only one left in camp when summer is over ... after 3 days of rain, arriving at breakfast to find a staff member fishing in a rowboat on a huge mud puddle in front of the dining hall ... rabbit furs ... 'Are You Psyched?' ... Staff sings after the campfire ... sticks on fire ... so much more!!!!! When looking at the 1963 staff photo I remembered that it was the year when we tore down Yale latrine! I'm sure that Dirk Van Hook was part of the crew smashing it to pieces with sledgehammers and axes. I drove the truck hauling away the fragments. Keith Nixon from the UK was our International Camp Staff member in 1986. Click on his photo to read his story about his trip to Camp Hinds. From Arthur Berry - Transcribed from a talk given at the Order of the Arrow Banquet on December 6, 2008. Arthur was a camper in 1941 and 1943, then on Camp Hinds staff 1944-1946. I remember that as a camper we were always warned not to go further out of camp than the blockhouse unless we were going to the ball field with our leaders. I remember when the campsites were still close to the waterfront. When I was on staff I was the bugler and had to watch the time all of the time - and play the correct bugle calls throughout the day. I missed one day when I went out in a canoe with a girl from Camp Kokatosi (now Kingsley Pines) and my clock (not a watch) fell in the lake, the WWII cardboard parts were ruined so I couldn't tell what time it was! During the summer of 1944 the staff began to notice that Percy Dunne (the Scout Executive) was wearing a white sash with red arrow when in uniform; soon George Anderson, the waterfront director and Dr. Nickles (senior camp director) were also wearing them. We all wondered what was going on. Then one evening at retreat the camp watched an Indian chief in a canoe come around Chipmunk Point and up to the swimming area. The chief got out of his canoe, strode up to the assembled camp and walked up and down the lines of troops and staff. When he came to certain boys he firmly tapped down on their shoulder – 1, 1-2 – and walked on. After the ceremony those who had been tapped were instructed to meet that night to begin their ordeal. We were led out of camp into the woods, and one by one we were told where to spend the night. I was told to “go straight into the woods for twenty-five paces and sleep on that spot.” The spot turned out to be a stump, so that’s where I slept. The next morning the boys were brought back to camp, where we spent the day in complete silence on camp service jobs of various kinds, with no food, only water to sustain us. That evening we were given a feast, followed by the induction ceremony into the Order of the Arrow. Someone called the Council Office and asked Mike if he knew the birthdate of Billy Hinds, or the date of his death. Mike said that he did not know. They explained that they now live in the Hinds house at 27 Chadwick Street. There is an old clock there which came with the house. These people had it repaired and it ran well for several years, then quit. Then all of a sudden it began running again, causing them to wonder if the date it stoped or started again is related to Billy's life or death. 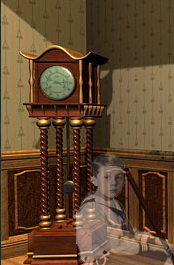 It seems that when the grandmother was staying in the house, one night she awoke to see a small boy in the corner of the room - but there was no one there! Gordon Lightfoot sings about the Wreck of the Edmund Fitzgerald; Schooner Fare, my favorite folk group, sings of the Wreck of the Mary Ellen Carter; Henry Wadsworth Longfellow wrote about The Wreck of the Hesperus. Sit down and listen while I relate The Wreck of the Tenny Belle. William Bucknam Hinds was an 8-year old boy. He was killed in a traffic accident in 1925. His parents manufactured and distributed Hinds Honey and Almond Cream, a nationally known beauty aid of the era. After the death of their child, the Hinds family wanted to do something for the youth of Southern Maine. They decided to donate funds for the purchase of 125 acres of lakefront property to the newly-formed Cumberland County Council (predecessor of the Pine Tree Council) of the adolescent Boy Scouts of America. Thus came into being Camp Hinds. The camp itself hasn’t changed much in 70+ years. Campsites have been added; cabins have been moved or demolished; improvements have been made. But, the plan of the camp still revolves around the Triangle, the central physical area of the facility. Landmarks such as the Blockhouse, the Rec Hall, the Council Ring, the Dining Hall, and Harvard (the only public flush toilets in the camp) can still be found at various points along the Triangle. The New Health Lodge, built in memory of Dr. John Konecki, one of camp’s early scouts, and father of Tom Konecki, one of my compatriots, can now be found within the boundaries of the Triangle. One of the most interesting features of the camp is that it is divided by the Tenny River. This 2 mile long body of water connects Panther Pond with Crescent Lake. There is no current to speak of, and its meandering curves provide ample boating space for hundreds of boys each summer. The “other side” has seen the most development in recent years. New campsites like Siple, Brownsea, Bailey, and Maguire (named for my very own Scoutmaster and long time Camp staff member Frank Maguire) have sprouted in the past 15 years. But, when I was a Scout, attending camp for my very first time, there was only one campsite on the “other side” -- Tenny Campsite. Tenny Campsite was unique. Instead of huge 4 main tents, Tenny had two-man Adirondack lean-to cabins. These were situated in a long, meandering row facing Panther Pond. Tenny had its own Rec hall and leaders’ cabin. At one time, this was the Senior Scout campsite, but, by 1963, it had become just one of the regular sites for troops to camp at for a week or two during the long Maine summer. There was only one way for the Scouts of Tenny Campsite to get to places like the Dining Hall, the Waterfront, the Trading Post -- the Tenny Belle. The Tenny Belle was a raft built on six 55-gallon drums. It was propelled by a rope-pulley system -- a scout would stand on the raft with one or two of his buddies and pull, hand over hand, the Tenny Belle across the river. It was absolutely THE neatest thing at camp. Some kids loved the waterfront; others spent hours at the Nature Lodge or the Rifle Range. Me? I spent most of my first week traveling back and forth across the Tenny River on the Tenny Belle. It was the thing that made camp unique in my 12 year old mind. Camp had a Dining Hall; School had a cafeteria. Camp had a Waterfront; Fort Williams had a pool for swimming lessons. Camp had a Trading Post; my neighborhood had Millie’s store. Camp had a Health Lodge; my mother was the neighborhood nurse. But no other place on earth had a Tenny Belle. Getting on the Tenny Belle was not an easy task. From the Dining Hall side, the ground sloped toward the river. Scouts doing their good turns had built “steps” into the bank making the descent easier. But, the Tenny side was something else. There was no easy slope, only a difficult bank. Scouts over the years had tried to carve steps into the reluctant Maine soil, but the approach resembled more a ladder than a stairway. The Tenny boys always had an audience at breakfast and lunch times to see who would make it and who would not. The Tenny Belle had a capacity of SIX BOYS. There usually were more than six, of course, but that was part of the fun -- to see what would happen if there were more than SIX BOYS on the Tenny belle as she made her way across the river. Since being late for a meal was THE cardinal sin of camp, occasionally someone would cut the lines to the Tenny Belle, effectively stranding anyone on the other side. Troop 22, Holy Cross Church, South Portland, Maine, always spent two weeks at Camp Hinds. Many other troops only spent one week, so Sundays were very busy days. Several groups were leaving, while new groups were coming to take their places. And that meant parents. Not only parents, but aunts and uncles and grandmothers and grandfathers and sisters and brothers and cousins several times removed. My parents weren’t coming, so I just wandered around camp, dressed in my full scout uniform. My journey took me to the shores of the Tenny River and the Tenny Belle. It seemed as though there were hundreds of people who wanted to ferry themselves across the river on the Tenny Belle. I sat on the top step of the path from the Dining Hall and watched in amazement as adults and boys crowded onto the Tenny Belle. The first few trips back and forth I counted FOURTEEN people; on one trip I counted SIXTEEN, but ten of them were small boys. The Tenny Belle seemed to ride low in the water, but everyone was laughing and having a great time. I can’t be sure -- it has been more than 30 years -- but it seemed that, after the group of SIXTEEN, each trip across the river included one more passenger than the previous trip. I watched in horror as the number climbed to TWENTY-TWO passengers. With the surety of hindsight, I realize that as long as the weight was distributed the Tenny Belle would do her job. A large family passed by me on their way to the Tenny Belle. I knew from its size that they wouldn’t all be able to go across at once. But, in true Yankee spirit, they tried. They forgot about distributing the weight. BANG! BANG! BANG! Three floats on the port side exploded out. With no flotation on that side of the raft, the Tenny Belle pivoted on its axis, sending an entire family into the leech-infested waters of the Tenny River. The noise was horrendous, and the camp brass scurried to the river to see what was going on. A horrible sight greeted them: mothers and fathers in their Sunday best were clambering up the banks of the Tenny River with swamp grass in their hair and river water in their shoes and their sons squatted in the shallow water in their brand-new uniforms from Benoit’s. The Tenny Belle lay helpless on its side in the middle of the river, a victim of overcrowding. The Boy Scouts have always been conscious of their image, and the prospect of lawsuits over a piece of transportation history did not thrill those who made the decisions. At the end 1965 camp season, the Tenny Belle was laid to rest. A new green wooden footbridge wide enough for three boys walking abreast and capable of supporting whole patrols of mothers and fathers was erected before the following season. Her nameplate enshrined on a rafter in the rec hall along with some memories and a couple of faded photographs is all that remains of the Tenny Belle. In 1962, when I was program director, the Scoutcraft department, directed by George VanAmburg, was looking for out-of-camp locations which they could use for overnight camping. We had been told that the council owned some land on Nubble Hill so we directed the campers in that direction but we had no idea of the boundaries of the property. George began sending groups up to the back of Nubble Hill where they camped in the area between the hill and Nubble Pond, accessed by the old dirt road which begins not far beyond the Catholic Church on route 85. It was possible to drive up that rough old road to deliver food and water to the groups camping there. But we still did not know our boundaries, so I went to the town office and got a description of the lot from the tax maps. The site was landlocked and not clearly identifiable, so I called Mr. Alford Mann, the abutting land owner, who lived in “downtown” Raymond. He was more than happy to help us out and he agreed to meet me the next day at the camp gate and he would show me the property lines. That morning Mr. Alford Mann of Raymond showed up in an ancient Model A Ford pickup truck, and drove me to the road mentioned above, and up that road a couple of hundred yards to where there was an iron pipe set on the left near the road. We got out of the truck and Mr. Mann, an elderly gentleman carrying an axe and wearing bib overalls which covered his ample waistline, led me from that iron marker into the woods to a second iron pipe, which, he explained, was his and our corner. We proceeded as he blazed a trail by chipping the trunks of trees in the way that the old-timers did every few years to define their property lines. At the next marker we turned in a southerly direction and headed for the cliff of Nubble Ledge and down the side. We turned left again and headed back to the road. This was clearly a lot of hiking for Mr. Mann, who handed me the axe to carry back, and when we reached the truck he suggested that I should drive it back to camp. That’s the only time I ever drove a Model A. He then took the wheel for the drive back to his home and I went back into camp to explain to George and the Scoutcraft crew where our property actually was. That’s the only time I met Mr. Mann. In 1970 the Scoutcraft staff got itchy again to camp in the wilderness so they planned an overnight to Rattlesnake Mountain. I believe that permission was granted by Hancock Lumber so off they went on their adventure. The next day we received a phone call from the Fire Warden asking if we had been on Rattlesnake the night before, and on being assured that we had a group up there they said that they had received panicked phone calls from people who saw a fire up on the ledges and were afraid of a forest fire. It seems that no one registered for a fire permit, leaving the rangers literally in the dark. I then had to fill an Indian pump with water and make a special trip up the mountain with a Scout from Kennebunk who volunteered to accompany me. We drove up route 85 to the point where there is/was an old logging road up the mountain. After climbing up we located the dead ashes of the campfire, thoroughly soaked them, and got back to camp before retreat. There we found that the boy’s Scoutmaster was pretty upset because the boy and I hadn’t told him we were going. In that episode we learned two lessons about getting permission! In 1978 I was the Program Director. I was a high school music teacher then, teaching in Plattsburgh, NY (across Lake Champlain from my family in the Burlington, VT area) and was speaking to my Uncle Ralph during the winter of 77-78 that I did not want to work locally that coming summer. Ralph was a scout executive (he worked his way up through councils from Nashua, NH through MA, Nebraska, Colorado and eventually becoming the scout exec in LA) and knew Bud Jeffries who called me and offered me the one year position at Hinds in preparation for being the Base Director for the Matagamon HIgh Adventure Base the following summer (which I did in 1979). I had a great summer at Hinds (and the following year at Matagamon), ones I remember fondly and often speak of with people here. Being from Vermont, I stayed over on Saturday nights (even had a summer girlfriend with a young lady from North Windham) and enjoyed camp life, planning each week's events, going to National Camp School (where I was offered a teaching position following my week there), working with Mike, Steven, George, Ken and the others there. I even got involved in the music program at the Amherst Camp around the corner and played there once a week in one of their jazz ensembles. Now I am too busy supporting my family (with multiple part-time jobs and three home businesses) to do much in Scouting besides serve as a merit badge counselor. My two boys are scouts (my wife was their den mother) with one working on his Eagle Project and the other a Star headed in that direction. Too many Camp Hinds memories to bore you with, but again, appreciate your work on the site and please give anyone who might remember me my email address. A surprise letter came from Scout Executive Percy Dunn in the spring of 1943. He had become the Executive of Pine Tree Council in Maine and needed a Field Scout Executive to be Chief of Staff at Camp William Hinds beginning in June. Would I consider joining him again in this new assignment? The offer was attractive since I was looking for a new and greater challenge in this time of national crises. It was not my intention to leave the Christian ministry. A war time commitment interested me. At Percy Dunn’s prompting, I flew to Portland, Maine for a job interview. It was always inspiring to be with P.L. Dunn and this visit convinced me to team up with him again in Pine Tree Council and Camp William Hinds. Percy introduced me to Maine lobster at Boone’s Place on the wharf in Portland. How delicious! There were many decisions to make and arrangements to settle before leaving for the Scout camp in early June. Madeline was expecting our third child the first of June so the church agreed for her to stay in the parsonage until I would come for her and the children in August. Clora Harris volunteered to take Madeline to the hospital when the time came. John Preston—named for his two grandfathers–was not born until June 30, 1943, a month later than expected. Through all the stress of this transition period Madeline demonstrated remarkable courage. Looking back, I marvel at her faith and stamina. The ensuing weeks were perhaps the most trying of our lives. 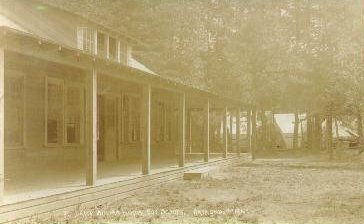 Camp William Hinds, owned and operated by Pine Tree Council Boy Scout of America, was located on Panther Pond with the Tenney river running through the camp and emptying into the lake. Pond was a misnomer. It was a four mile long lake, half a mile wide. The water was clear and refreshingly cool. Most of the camp property was wooded. I was enthralled on my first visit to the camp. As camp Chief of Staff, I worked with thirty-five adult and junior staff men and two-hundred-fifty Scouts for two-week periods through the summer. Soon after camp began problems with some veteran staff members developed. I do not want to give the impression that the 1943 camping season at Camp William Hinds was a failure. Five or six adult staff members, and perhaps as many junior staff personnel, created the problems. There were a number of talented and dedicated men who were loyal to me and who helped to make the camping experience memorable for the hundreds of Boy Scouts in camp. However, had it not been for the unwavering support of Percy Dunn, I doubt if I would have survived the summer. Immediately after camp was over I drove the camp truck to Alfred Station to bring our family and household goods back to Auburn, Maine. Because it was war time, special arrangements to purchase gasoline for the truck and our V8 Ford had to be made with the proper authorities. Returning to Madeline and the children after the trauma of the summer was an emotionally happy experience. What a thrill to see baby John, now eight or nine weeks old, for the first time. He was a beautiful baby! I could only guess at how difficult the summer had been for Madeline. She was a “survivor”. Tears were shed as we drove away from Alfred Station in the loaded truck and our Ford car. Madeline had Anne, Daniel and John with her as she drove. The more than four years with Second Alfred church, our first pastorate, had been fruitful and happy. We were leaving our first home, after the Gothic in Alfred, and many friends dear to us were being left behind. The trip to Maine was arduous, especially for Madeline. We were fortunate to be able to spend the first night on the road in Berlin, New York with our friends, Pastor Paul and Ruby Maxson. It was difficult to find a motel the second night. No lights were allowed outside places of business because of the war so we literally groped our way into a motel kind enough to take us in. It was heartwarming and reassuring to have Percy and Clara Dunn help us settle in to our rented apartment on Beacon Avenue in Auburn, Maine. Lewiston Auburn is the twin city that was headquarters for the Pine Tree Council district I was to serve as Field Scout Executive. Our first floor apartment was on top of a hill that overlooked the city of Lewiston and the Androscoggin river. Remodeled from an elegant home, the apartment had hardwood floors and a beautiful fireplace with a ceramic arch decorated with a woman’s face, oak leaves and acorns. It was pleasant to come home from night Scout meetings and sit with Madeline in front of a cheery fire. I often brought home a huge Italian sandwich or a lobster sandwich to enjoy together. We paid $30.00 a month for the apartment. A coal furnace was our heat source and, because of war time restrictions, we brought coal home, one bag at a time, in our car. I foolishly used kerosene one morning to relight the furnace fire. The kerosene exploded in my face, singing my hair and burning off my mustache. It could have been a major tragedy but it was an embarrassment for a Scout Executive. Because washing machines were not available during the war, Madeline was forced to wash all our clothes by hand until the Irish lady next door saw her predicament and gave her a working old electric washing machine. We were thankful for it and did not replace it until after the war. The washing was done by putting the clothes in a revolving basket with wooden slates. The war caused restrictions and inconveniences that are now forgotten. Being Field Scout Executive for the Lewiston-Auburn District of Pine Tree Council was interesting and demanding. The district covered the communities from Lewiston-Auburn north to Rumford. More than four feet of snow the winter of 1943-44 made travel sometimes hazardous. Days found me in the district office much of the time and most week nights I was visiting Troops or conducting committee meetings relating to Scouting. A number of Troops were made up of French-Canadian Scouters and Scouts whose meetings were conducted using the French language. I remember Freddie LeBranche who was the Scoutmaster of an excellent Troop. He and his wife became close friends. The British had a base at the Lewiston airport for training British pilots to fly Grumman aircraft. A number of the pilots were English Boy Scouts and came to our office to get acquainted. We had Norman Bleers, a charming British Scout, for dinner several times. We wonder, “Did he survive the war?”. Those were the terrible days when England was being subjected to devastating bombings day and night. “The Happy Gang”, a Canadian radio program we heard almost every day, often sang, “There’ll always be an England, and England will be free, As long as there’s a cottage small beside the crystal sea”. When there was a movement under way to send English children to the United States to escape the bombings, Madeline and I applied to host one. We corresponded with the father of the child scheduled to come to us and he sent us a burned out German fire bomb. It was decided not to evacuate the children. Madeline and I participated in a number of church and community activities in Lewiston-Auburn. Madeline sang in the Congregational church choir and was active in a Baptist Women’s organization. I preached many Sundays in rural and small town Baptist churches. My “barrel” of sermons was made use of often. An experience with birds deserves telling. I came home from the office for lunch one day to find a flock of beautiful birds eating the seeds on the ash tree in our front yard. The markings on the birds were yellow and black and a search of our bird guide led us to believe they must be Evening Grosbeaks. One hitch was that the guide said this species was seldom seen east of the Mississippi river. This flock of birds couldn’t have been farther east than this. When I telephoned Dr. Sawyer, a Bates College biology professor and a member of my District Board, he assured me that we were seeing Evening Grosbeaks. They had been observed in Maine for several years. It was intellectually stimulating to meet monthly through the winter with Peter Bertocci, a Bates College professor, and the local Unitarian minister. We met in our home and took turns presenting a paper on some issue and then discussing it. I believe sociology was Dr. Bertocci’s field. He later became a professor at Boston University and authored one or more books. I can’t recall how the idea of our getting together originated. We enjoyed it. I joined a group of people interested in target archery in forming the Orumby Archery Club. “Orumby” was the name of a renowned Indian in the history of the area. We established an archery range on which we could shoot the York round requiring a number of 100 yard shots. In the archery club I met Harold A. Titcomb (Uncle “Hat”). His name was prominent in target archery circles and he was most helpful to us in organizing our local club. Madeline and I were honored to have him as a guest in our home and I was in touch with him later. Our family life in Maine sometimes was lonely, especially for Madeline. We missed our families and friends acutely and were thrilled to have cousin Vida Randolph Barrs bring her three children from Boston to visit us. Christmas Eve we attended the very large and beautiful Saint Peter’s Catholic church Midnight Mass. The priest was active in our Scouting program. Anne was five years old in June of 1943 and so went to kindergarten in Auburn in September. It was exciting to follow her progress and enthusiasm in school. One winter day Daniel, who was not yet three years old, wandered away from our house causing Madeline to call me at the office greatly alarmed. I rushed home to receive a call from the nearby fire station that a little boy was there who might be ours. Baby John made us all happy as he grew. He was caught one day with a caterpillar in his mouth as he sat on the front lawn. Before camp began in 1944 we were surprised to receive word from Rabbi Karl and Eva Weiner that Karl was going to be on the staff of a private camp not far from Camp William Hinds. Arrangements were soon made between us to have Eva and their baby, Danny live with Madeline and our children for the camp season. It worked out well for Karl and me to have the same day off each week from our camps and be at home together with our families. Madeline and Eva enjoyed being together. They had religious discussions in which they compared Old and New Testament scriptures. Eva was pleased to learn how to sew from Madeline. After the camping season the Weiners moved to Colorado Springs, CO. Serving as Chief of Staff for Boy Scout Camp William Hinds on Panther Pond was sheer joy in 1944. Percy Dunn and I recruited the entire staff and we were in full control of the management and program for the camp. I was happily surprised to be inducted into The Order of the Arrow, a national Scout organization, in an impressive Indian ceremony. I supervised the construction of an outdoor chapel and an archery range for the camp. Blueberries grew in abundance on the camp property and one week we sent the campers out, by tents, with #10 cans to pick blueberries. The winning tent got a watermelon as a prize. Our cook baked blueberry pies and blueberry muffins enjoyed by everyone. One unique program event during the camping season stands out in my memory. The father of a camper was a talented camper, fly fisherman, canoeist and general outdoorsman. On our invitation he took a day at camp to set up a model camp and demonstrate axmanship, fly casting and poling a canoe. His relating of fishing and camping experiences kept the Scouts spellbound at evening campfire. An Indian council fire I led at Camp William Hinds one evening when the “Old Timers” from Portland, Maine were our guests is unforgettable. The “Old Timers” were affluent business men who were supporters of the camp and who came to visit every year. The fire was laid in the campfire ring and the Scouts filed silently into the arena with blankets over their shoulders and wearing single feathers on their heads. I wore a full Indian headdress and opened the ceremony by invoking blessings from each point of the compass. Facing north with arms outstretched I intoned, “O north wind, bring us FIREI”. At that moment flames burst out of the wood laid for the fire. It was awesome! As you may have guessed, the burst of fire was brought on by a mixture of chemicals that were activated by a staff man in the edge of the circle who pulled on a black thread attached to the neck of an open bottle at the base of the firewood. I had never seen it done before but it worked perfectly. ~Written by Elmo Fitz-Randolph in his autobiography. Here is to the 2015 Camp Hinds staff congratulations to you all! An original poem, dedicated to all the members of the 2015 Camp Wm Hinds Staff as they close the season.